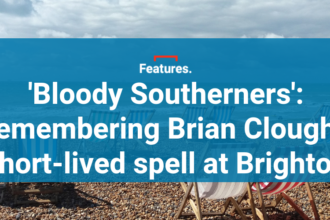 We’ve already selected five clubs to consider managing on FM18 but here’s something a little different. Rather than start your managerial career from scratch, why not try emulating some real life coaches who conquered the game from the dugout? The task here is a simple one: build a dynasty. When Alex Ferguson took the reigns at Manchester United in 1986, before he became a Sir, he inherited a club that was second from bottom in the old First Division and without a top-flight title in 19 years. By the time he left some 27 years later, United had overtaken Liverpool as England’s most successful ever club with 20 league titles, adding two Champions League triumphs to boot. Fergie was a one-off and it’s unlikely anyone will stick around at a major club for as long as he did ever again. Arsene Wenger is still hanging on at Arsenal and Paul Tisdale is in his 12th season at Exeter City, but it’s getting increasingly difficult to survive at any club for longer than a year or two. The same is true for FM18. The addition of squad dynamics has made your job slightly harder as there are ringleaders in the dressing room actively plotting your downfall (damn you, Virgil Van Dijk), while the AI managers are more tactically savvy than ever before. However, it can be done. Begin this challenge by either taking charge of a big club from the start, or doing it the authentic way and starting out in the Scottish lower leagues before getting your big break later on down the line. The aim: Build a dynasty. 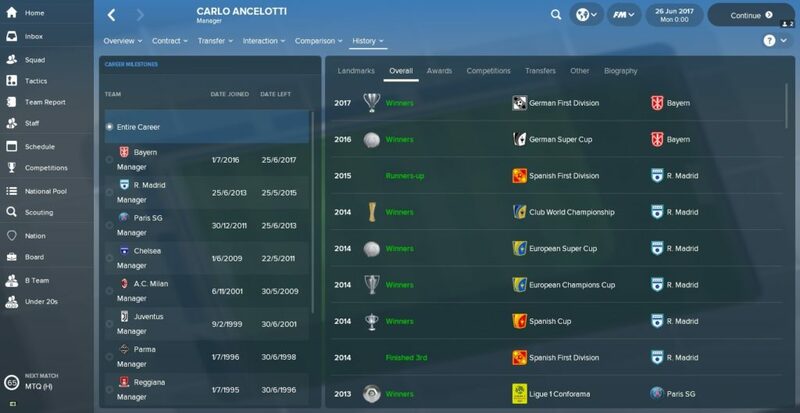 Don Carlo’s reputation has taken a bit of a hit recently following his sacking by Bayern Munich, but his CV speaks for itself. The Italian is a renowned winner having won 19 trophies in a 21-year coaching career. But what makes Ancelotti stand out from the crowd is that he’s brought success to clubs in each of Europe’s top five leagues. Ancelotti won league titles in Italy (AC Milan), England (Chelsea), France (PSG) and Germany (Bayern Munich) and, while he didn’t conquer La Liga during his time with Real Madrid, he did deliver a long-awaited 10th Champions League title. In the modern game it’s becoming increasingly common for managers to hop from one club to another, but few have come close to matching Ancelotti’s success. Now it’s your turn. Find this challenge too easy? Why not head over to South America and try it there instead. The aim: Conquer Europe’s big leagues. Unlike the Ferguson and Ancelotti challenges, this is a very specific test: win a European trophy with Benfica. In 1962, Hungarian manager Bela Guttmann steered Benfica to a second successive European Cup victory, but was denied a pay rise despite his achievements. The story goes that Guttmann, so enraged by his employer’s refusal to reward him for his success, put a curse on the club to stop them winning a continental trophy ever again. Some 55 years later and Benfica are yet to add to two the European trinkets that Guttmann delivered in the 1960s – despite competing in eight different finals in the intervening period. Like the non-scoring curse that takes over Harry Kane in August, the Guttmann curse is very real indeed. Spooky. 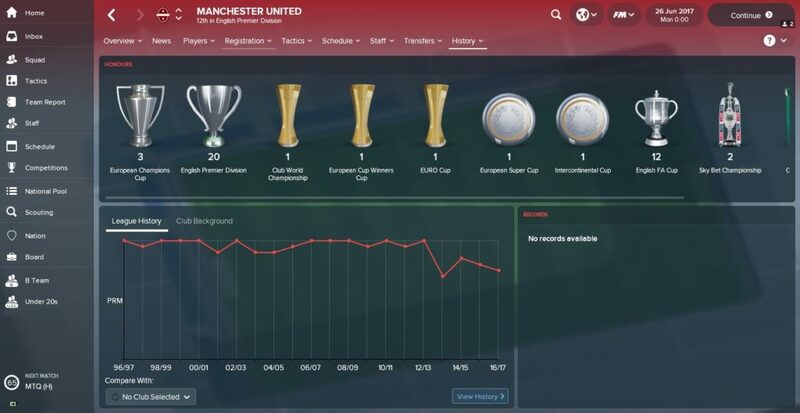 Your challenge is to bring back European glory to Benfica before the drought reaches six decades. It could be a tall order as this Benfica squad needs some fine-tuning following the fire sale in the summer – Victor Lindelof, Ederson, Nelson Semedo and Konstantinos Mitroglou (yep, that one) were all sold without being adequately replaced. The aim: End Benfica’s European trophy drought. 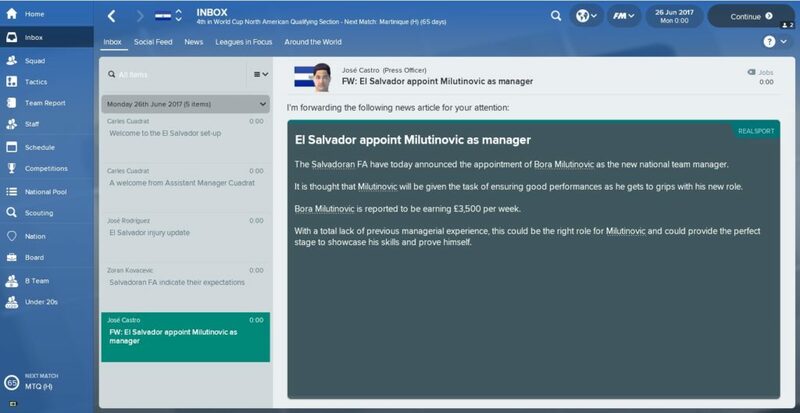 Much like in the real world, international management can be a bit frustrating on FM18. You spend most of your time on holiday or else watching the odd game from a corporate seat under the pretence of doing a bit of scouting. However, there can be a lot of fun to be had as an international boss. Who wouldn’t want to be involved in the World Cup, after all? While FIFA are doing their utmost to ruin the World Cup by allowing a quarter of the world’s countries to compete in it from 2026 onwards, it remains by far the biggest global tournament in sport. Even the much-maligned qualification process can be enjoyable in the game too. One man who knows the tournament better than most is 73-year-old Velibor “Bora” Milutinović, who has presided over five separate World Cup campaigns as a manager with five different nations. Bora wasn’t exactly working with the world’s best teams either, coaching Mexico, Costa Rica, the United States, Nigeria and China at the finals between 1986-2002. If you decide to load up a mega-database on FM18, you’ll find that there are 108 different countries to manage, ranging from Argentina to Azerbaijan, Brazil to Burkina Faso, England to El Salvador. With so many nations to choose from (including Kosovo for the first time) this could be the challenge to steer you away from club football. The aim: Qualify for five successive World Cup finals. (The smaller the countries, the better). Step one: Go up to the attic, dust off the globe that your great aunt got you for Christmas eight years ago and give it a spin. Step two: Close your eyes and stop the globe from spinning. Step three: Wherever your finger lands, that’s where your managerial career begins. For me, this means FC Spartak Trnava in the Slovak Super Liga. I can’t wait. Granted, this almost certainly isn’t how Graham Potter landed his first and so far only managerial job at Swedish side Östersunds FK, but for someone who spent the entirety of their playing days in English football, it was perhaps a surprising place to start out. When Potter took charge of Östersunds in 2011, they were languishing aimlessly in the Swedish fourth-tier. Fast-forward to the present day and they are playing in the Allsvenskan (Sweden’s top division), are the reigning national cup champions and are in the Europa League courtesy of sending Galatasaray packing in qualifying. 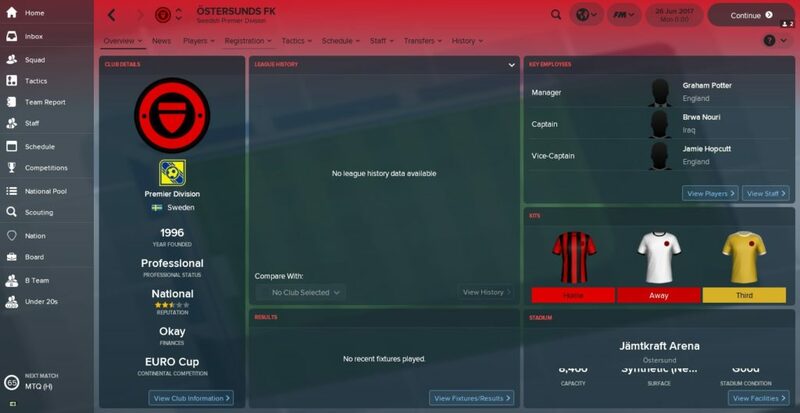 The job Potter has done at Östersunds is Football Manager brought to life. Now it’s your turn. 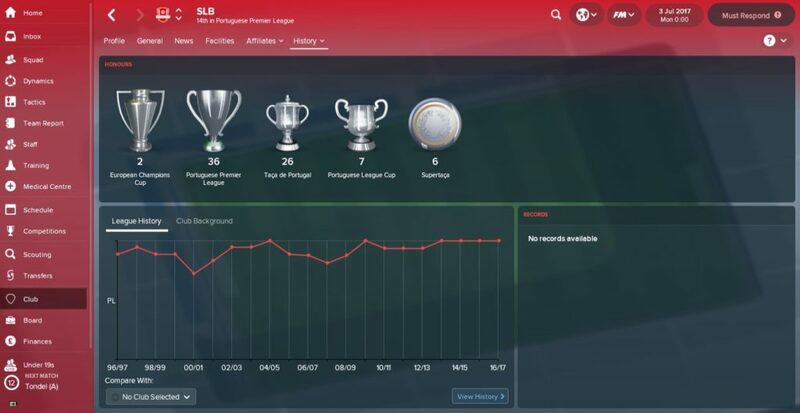 The aim: Build your reputation away from the bright lights of the Premier League.